As you might know, gluten is found in many grains, which is why those maintaining a gluten-free lifestyle avoid drinking beers that are made with wheat and barley. But did you know that not all grains contain gluten? Sorghum, rice and corn are three grains that are commonly used in gluten-free products. We brew our Tread Lightly Ale and 3R Raspberry Ale with sorghum and Off Grid Pale Ale with brown rice rather than wheat and barley. Sorghum is a grass that is grown in warm, dry climates around the world. Sorghum is grown in many different countries around the world, including Argentina, Australia, Brazil, China, Ethiopia, India, Mexico, Nigeria, Mexico, the United States, and Sudan. In the U.S., sorghum is mainly cultivated in a crop belt that runs from Southern Texas to South Dakota. It’s considered the fifth most important cereal crop in the world. 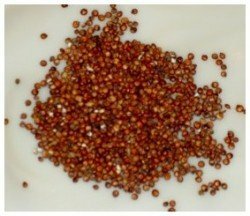 https://www.newplanetbeer.com/wp-content/uploads/2010/05/GrainSorghum1-e1273887453274.jpg 216 250 GFBeer https://www.newplanetbeer.com/wp-content/uploads/2016/01/mobile-logo.png GFBeer2012-02-24 09:45:592012-02-24 09:55:20What is Sorghum?